Cafe Arzu is a Bukharan/Uzbek/Uighur restaurant, and it was for the last ethnicity’s food that we were making this epic trek. 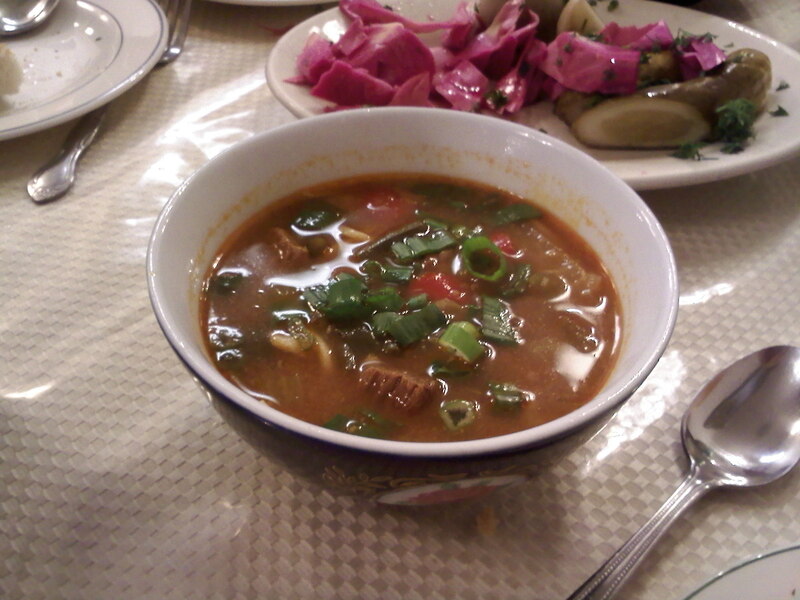 My father has been the legal counsel for seven of the Guantanamo Uighurs since 2004, and every time he comes to New York, I tell him “there’s this Uighur restaurant we have to go to,” and every time it is too far from midtown. Last night the restaurant in question (Cafe Kashkar in Brighton Beach) was still too far, but Cafe Arzu, in Forest Hills, was not. When we arrived (finally! ), my dad-is-going-to-complain-I-only-ever-take-him-to-rat-infested-god-knows-what’s-in-their-storeroom-hole-in-the-walls radar was beeping persistently. The room boasted metal and foam community-center chairs, laminated table cloths, generic ketchup, dusty sugar cubes, and landscape paintings using the limited, if calming, palette of seafoam, sky blue, and brown. But! There were loads of Russians and Uzbeks, the menus only had pictures of food on their covers, and the multitude of foodstuffs laid upon the laminate looked appealingly foreign. We were sat by a brusque server who immediately wanted to know what we’d be ordering. “I’m Russian,” she said, not very apologetically. “What do you want to drink?” My father persisted. “Yes. We have.” By this point the rest of us had found the Uighur portion of the menu. “Here it is Dad,” I said, as he squinted at the cyrillic. “Wine?” This got a smile out of her. I watched an old man at the table across the way pour something clear from a flask into the paper cup in front of him while his wife scowled. “No. You bring.” Defeated, my father settled on green tea. And then we ordered, oh, EVERYTHING on the Uighur menu, along with some lamb and chicken kebabs just in case, and pickled vegetables for health. The bread and pickles came first. “These taste just like Jewish deli pickles,” one of us exclaimed. 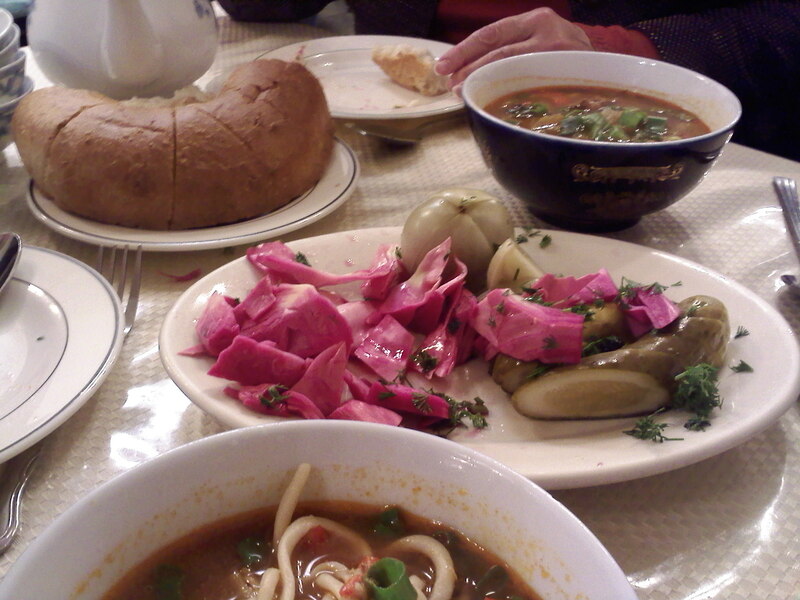 But the pink cabbage and green tomatoes tasted distinctly Russian, I thought, as I picked tarrogon out of my teeth. 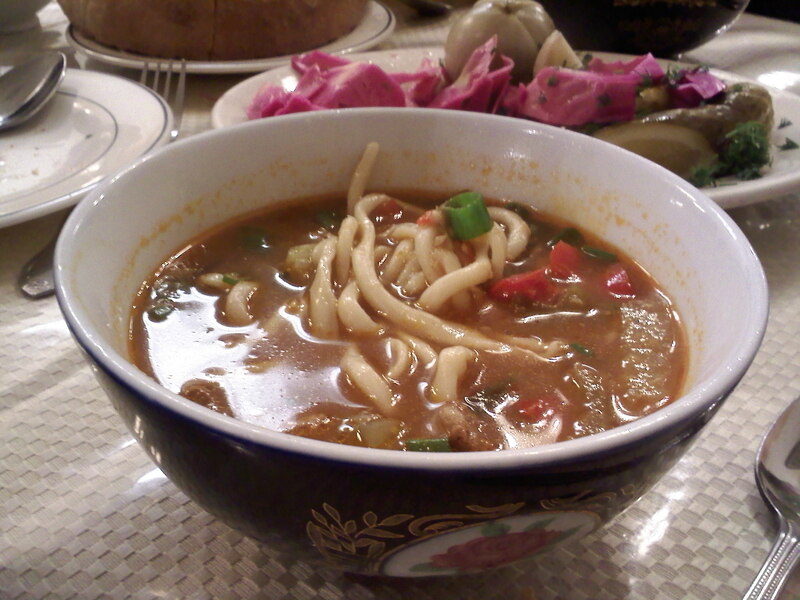 The bread, plate-sized disks called lepeshka, was wonderful—craggy salt crust and pillowy innards—perfect for dipping into our lagman, a brothy soup with chewy, hand-pulled noodles, beans, carrots, and chunks of beef. 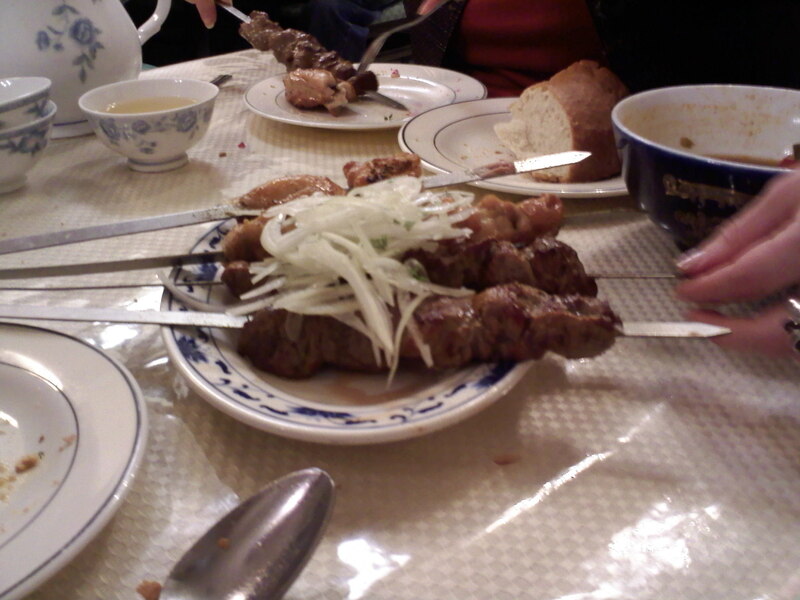 I’d already begun to feel full when our kebabs arrived, only they weren’t kebabs. They were swords, pierced by crackly, dripping pieces of lamb and chicken. The lamb was better, richer and more gamy, but the chicken was quite good, juicy and fatty where it’s typically dry and shriveled. 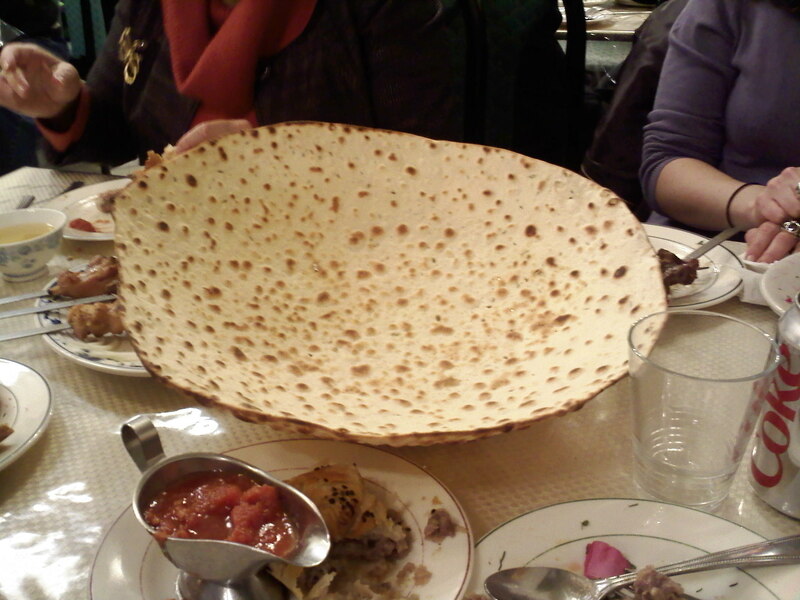 We weren’t even halfway through, though, when the samsa, or meat (I think ground lamb, though traditionally it’s mutton) pie appeared, followed in quick succession by manty, the Uighur version of dumplings, and a cracker the size and shape of a large mixing bowl. “You break,” our server told us, impatient to put the hot manty plates down. Timidly, I tapped the cracker bowl. Nothing doing. My father bore his first down imperiously, and one of the pieces of cracker flew into our server’s eye. Broken, the cracker lost its appeal, but the samsa and manty were lovely. The samsa reminded me of a pasty, only smaller and spicier, flecked with poppyseed and chopped onion. 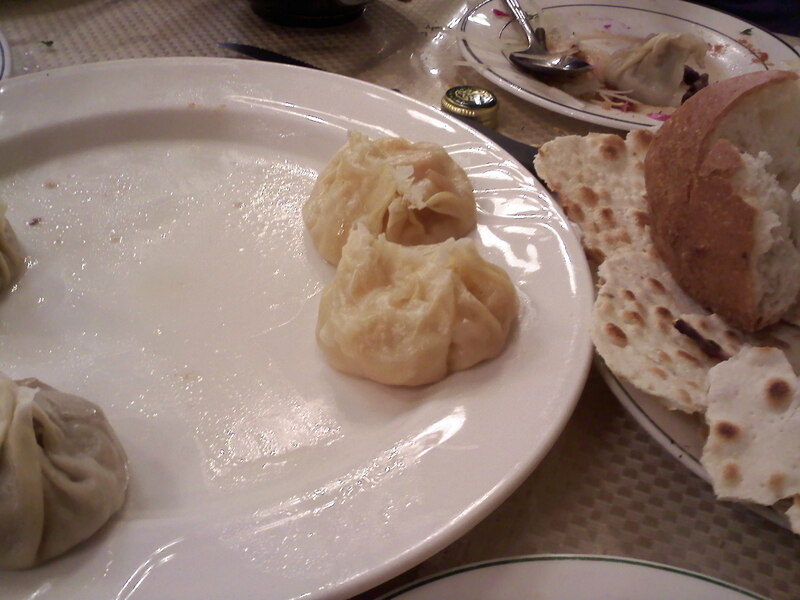 The same meat filling plumped out some of the manty, but the ones I liked better had only pumpkin, and tasted to me more like a light ravioli than a dumpling, in part because their wrappers were quite thick. I highly remocmend Columbia, Missouri. It’s almost dead center in the middle of the country. There are three colleges located in the downtown, very, very nice downtown area, co-ed’s all over the place, little shops, clean, etc. Columbia is considered a small city but it is growing constantly, everything is new and clean. There is a mall, plus many other brand new shopping centers. It’s nice and warm in the spring and summer and the town is quite accustomed to college students so getting a job won’t be a problem. And you will be able to get a very nice rental for less than $ 600 per month. I don’t know if they have the specific health food stores you mention, but I know they do have health food stores. There had been an older one downtown that had been there forever, but the opened a new one in the newer part of town, I just can’t remember the name of it. For nature hiking and biking, they have one of those rails to trails that goes right through the heart of town. If you follow it going out of town, it winds along the Missouri River, very beautiful and never crowded. I highly remocmend this town and if you want to ask me any other questions about it, I’d be happy to help you out if I can.